Plastics have distinguished history in various food-processing industries from hobby farms, to large industrial freezers, to craft breweries. Keeping your eyes open as you tour these facilities it is hard finding areas where plastics do not have applications: wear plates, guide tracks, star wheels, bushings, conveyor lining…In fact, one brewery we know of has a bottle-filling tap embedded in a large, square block of white UHMW. 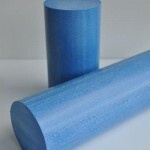 One fairly recent development in food-safe plastics are blue acetal and blue UHMW. These plastics are pigmented in a way that they will easily show up if a piece breaks off and contaminates the food. Reason being? Very few foods in nature are blue. Polyethylenes are some of the most versatile plastics and could be potentially involved in virtually any part of the food-production cycle. Be it in harvesting machinery, to conveyors, to freezing storage areas. White (natural) polyethylene is the most common. In fact, UHMW is often called the “cryogenic plastic” as its properties increase in cold temperatures. Therefore it is the ideal plastic to use in sub-zero applications. Acetal is an excellent plastic which often replaces nylon in applications with moisture as well as small, precise metal parts. Acetal machines beautifully and can hold tight tolerances. It was one of the first plastics widely marketed with a blue color. For more information how plastics can reduce downtime and increase profits in your application please contact us.